As an urban geographer I’ve been fascinated by two prominent boundaries in NYC: the East River separating Manhattan from Long Island (Brooklyn and Queens) and the Brooklyn-Queens boundary formed by Newtown Creek and the hills of the terminal glacial moraine. The contrasts across these lines are interesting by themselves; even more interesting is the potential they invite for connectivity and change! This was the site of my first public tour in 1982. Over the years I’ve offered many slants on this centrally located turf: a rail center, an emerging arts center, a brownfield locale, a home to the “Daylight Loft” factory building, the underpinning of the Queensboro Bridge, and a redeveloping waterfront. Routes can be designed around themes or basic geography. Walk the East River shore between the Queensboro and RFK (Triboro) Bridge. Begin at Queensbridge Houses and head for the remnants of Old Astoria. The sights include increasingly oblique views of Manhattan’s Upper East Side from three parks, a (former) piano factory, a huge power plant, a “big box” store, the Socrates Sculpture Park, the Isamu Noguchi Museum, and ante-bellum mansions. End in Astoria at the Bohemian Hall beer garden. A series of neighborhood walks focusing on the changing industrial waterfront from Long Island City (Queens) to Red Hook (Brooklyn). 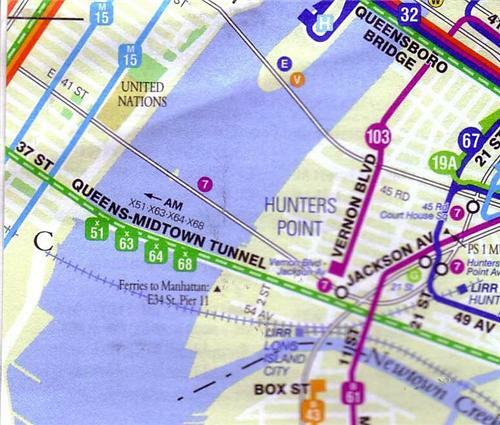 Transportation connections are made with the B61 and B62, two of NYC’s fascinating bus routes. Combined, these routes run the length of La Rive Gauche. Interpretive walks take place in neighborhoods in varying stages of artists’ influx and/or gentrification: Long Island City, Greenpoint, N. Williamsburg, S. Williamsburg, DUMBO-Vinegar Hill, and Red Hook. Contrasting tours of various lengths can be designed by choosing two or more neighborhoods. Between Glendale (Queens) and Highland Park (Brooklyn), the terminal glacial moraine forms a barrier between the two boroughs. This abrupt rise in the land, the spine of Long Island, was the source for much of Brooklyn’s water supply as well as the site of NYC’s major concentration of cemeteries. We ascend the moraine, cross Jackie Robinson Parkway and follow the boundary between Ridgewood, Queens and Bushwick, Brooklyn noting abrupt changes in the cityscape. Meets outside the Crescent St Station (J train) and ends at the Myrtle Ave (L train)/Wyckoff Ave (M train) station with connections to other parts of Brooklyn and Queens. Meet outside the Greenpoint Ave subway station (G train), meander through Greenpoint and cross the Pulaski Bridge connecting Brooklyn to Long Island City. See remnants of the intense and largely unregulated industrial development that thrived along Newtown Creek during the late nineteenth century before the consolidation of Greater NYC and infrastructure improvements rendered it obsolete. Route 2. View the striking NYC DEP Wastewater Improvement Plant (“Digester Eggs”) and its adjacent Nature Trail; end at a nexus of contemporary artists’ activity in Court Square, LIC. Williamsburg was briefly a separate city in the 19th century and its streets fan out to early population centers. Walk through its Artsy/Youth, Hispanic, and Chassidic communities where old architecture is renewed, restored, ravished, or left to rot. Rest and nosh before crossing the Williamsburg Bridge at sunset on the redesigned walkway to Manhattan. This tour is designed for after-work hours during late spring and summer and can meet at various Manhattan or Brooklyn subway stops. Bridges and Sunsets: Ravenswood/Hunters Pt. The waterfront of Long Island City, Queens has seen many waves of redevelopment due to its special transportation advantages. We walk in the shadow of midtown where commercial, residential, industrial and creative functions compete for space. Nosh and rest in the new Gantry Park. Cross the Pulaski Bridge to Greenpoint, Brooklyn at sunset. This tour is designed for after-work hours during late spring and summer and can meet at various Manhattan or Queens subway stops. “Upper” Newtown Creek forms the backdrop for the large truck-accessible industrial conglomeration of East Williamsburg and Maspeth. These waterways are inaccessible to boats, but are visible to the pedestrian along Metropolitan and Grand Aves, the arterials connecting Brooklyn and Queens. The Creek’s backwaters figure in controversial county boundaries. Unlike most NYC industrial areas, the trucking complex is investing in itself. This tidal arm of the East River forms the boundary between Brooklyn and Queens. At peak industrial build-up, circa 1900, it was one of the busiest waterways in the world. The surrounding area developed from marshland to a flourishing industrial center and then declined into urban brownfields. We’ll discuss the bridges, neighborhoods and industry at its edges from Long Island City to Maspeth. Requires a chartered boat such as NY Water Taxi. From Queens Plaza, the nexus of Queens’ post-WW1 transportation center, we follow Jackson Avenue past Courthouse Square to the old industrial waterfront, now Gantry Park. At the Plaza and the Park, new office buildings and residential towers cater to Manhattan spillover. At Courthouse Square a daylight artists’ community is consolidating. New landscaping has softened the look of a grimy past. Copyright © 2019 by Jack Eichenbaum. Site development by BigCityInteractive.com.